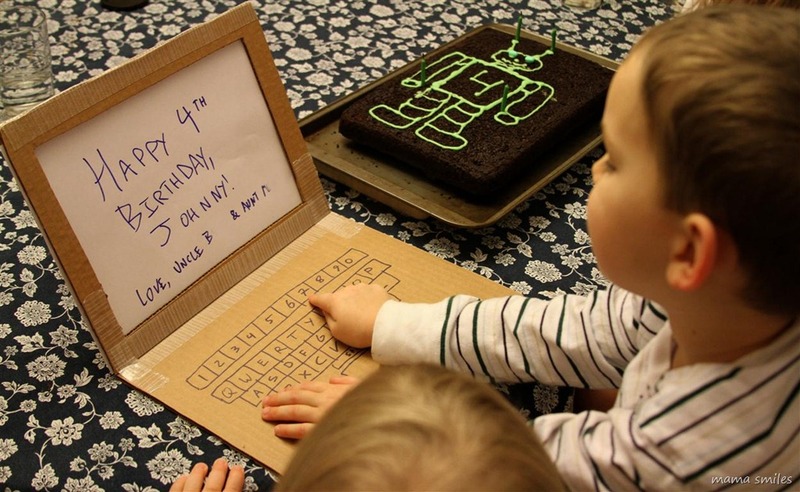 This cardboard laptop with interchangeable screens was the hit present at Johnny’s fourth birthday party, easily eclipsing the talking bear. I can’t take any credit from it – it was made by my brother B – who, incidentally, has apparently been given credit for the gifts Mike and I gave Johnny as well! That’s what happens when you bring the most awesome present! The design is very simple – two sheets of cardboard for the top, one for the bottom. The sheets of cardboard are roughly 9×12 inches each. One of the top sheets is identical to the one you see on the bottom; the other one has a screen cut out using an X-acto knife . The top sheets are open at the sides so that the kids can make new screens and slide them in and out. Clear Duck Tape holds it all together. Simple perfection! I love his laptop! It is extremely well constructed, which is to be expected from someone with two mechanical engineering degrees from Stanford. What a neat idea. Your entire family is so awesomely creative! That is a fun idea! I can foresee all sorts of ideas. So fabulous!! And this would be a wonderful place to use one of those stick-on dry erase papers, too. Those would be perfect for this! Ah – so this is what engineers make with cardboard. Brilliant! This is the same awesome brother who gave you the three boxes? I like him! A lot! Yes, it is! He is a WONDERFUL brother! My kids would love that too! Love that you can slide different papers in and out! So clever. LOL! Abby made herself a “laptop” once with a Children’s Place box that flipped open. She drew in the boxes for the letters and numbers too. It was quite funny. My class would love this! Love your laptop. So cooool! Have added it to Box Get Crafty! This is fab, such a brilliant idea. Will have to give it a go in 2012. This looks like something my brother would totally make too. Awesome. I want to try this and slide a dry erase board in the screen part! You can run off a keyboard from Google images. That’s a great idea! Thanks for the keyboard printoff idea, too.